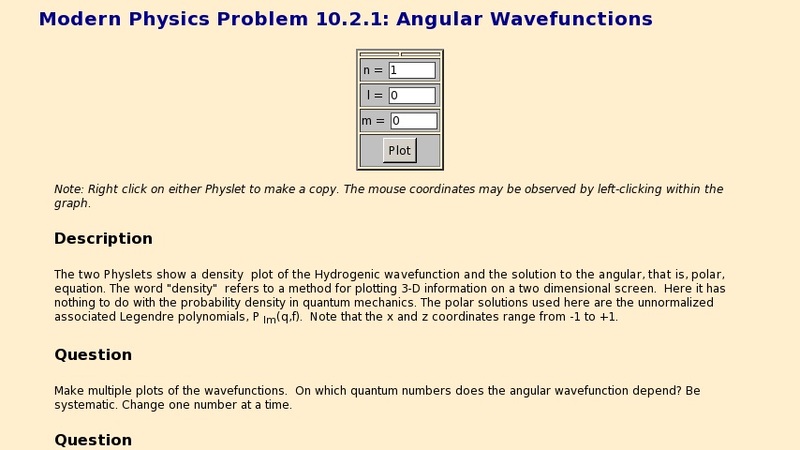 The two Physlets show a density plot of the Hydrogenic wavefunction and the solution to the angular, that is, polar, equation. The word "density" refers to a method for plotting 3-D information on a two dimensional screen. Here it has nothing to do with the probability density in quantum mechanics. The polar solutions used here are the unnormalized associated Legendre polynomials, Plm(q,f). Note that the x and z coordinates range from -1 to +1.